Definition at line 70 of file CREReportDefinition.cpp. 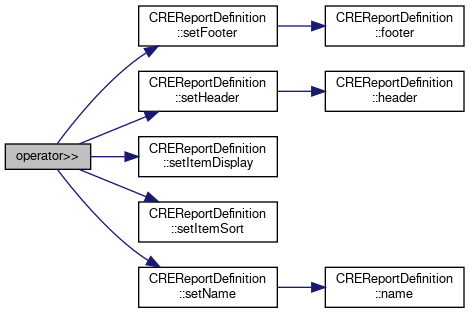 References CREReportDefinition::footer(), CREReportDefinition::header(), CREReportDefinition::itemDisplay(), CREReportDefinition::itemSort(), and CREReportDefinition::name(). Definition at line 76 of file CREReportDefinition.cpp. 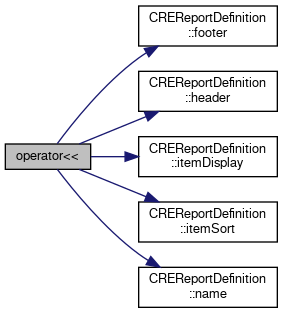 References CREReportDefinition::setFooter(), CREReportDefinition::setHeader(), CREReportDefinition::setItemDisplay(), CREReportDefinition::setItemSort(), and CREReportDefinition::setName().